This paper helps you understand the characteristics of different fiber types aides in understanding the applications for which they are used. Fiber optic cables are widely used in fiber optic communications. They are the medium of choice in telecommunications infrastructure, enabling the transmission of high-speed voice, video, and data traffic in enterprise and service provider networks. This paper answers the basics history, and application of fiber optic cables. A fiber optic cable is a is a flexible filament of very clear glass capable of carrying information in the form of light. It is consist of a glass core and cladding, buffer coating, Kevlar strength members and a protective outer jacket. Fiber optic cables are used to transfer digital data signals in the form of light up to distances of hundreds of miles with higher throughput rates than those achievable via electrical communication cables. 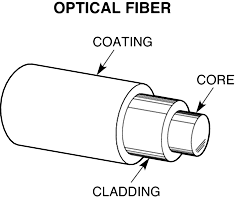 All fiber optic cables use a core of hair-like transparent silicon covered with less refractive indexed cladding to avoid light leakage to the surroundings. Due to the extreme sensitivity of the optical fiber, it is normally covered with a high-strength, lightweight protective material like Kevlar. The fiber optical fiber can be identified by the type of paths that the light rays, or modes, travel within the fiber core. There are two basic types of fiber: ingle-mode fiber (SMF) and multimode fiber (MMF). Multimode fiber cores may be either step index or graded index. Finished fiber cables can be categorized as outdoor, indoor, or indoor/outdoor. Single-mode & Multimode fiber are the two types of fiber in common use. Both fibers are 125 microns in outside diameter – a bit larger than the typical human hair. Single Mode cable is a single stand (most applications use 2 fibers) of glass fiber with a diameter of 8.3 to 10 microns that has one mode of transmission. Single Mode Fiber with a relatively narrow diameter, through which only one mode will propagate typically 1310,1490 or 1550nm. Carries higher bandwidth than multimode fiber, but requires a light source with a narrow spectral width. Singlemode fiber has the ability to carry a signal for miles, which makes it ideal for telephone and cable television providers. Single Modem fiber is used in many applications where data is sent at multi-frequency (WDM Wave-Division-Multiplexing) so only one cable is needed – (single-mode on one single fiber). Single-mode fiber gives you a higher transmission rate and up to 50 times more distance than multimode fiber, but with a higher cost. Single-mode fiber has a much smaller core diameter of 8.3 to 10 microns than the multi mode. The small core and single light-wave virtually eliminate any distortion that could result from overlapping light pulses, providing the least signal attenuation and the highest transmission speeds of any fiber cable type. Multimode fiber has a large diameter core of 50 or 62.5 microns that allows multiple modes of light to propagate. Because of this, the number of light reflections created as the light passes through the core increases, creating the ability for more data to pass through at a given time. Because of the high dispersion and attenuation rate with this type of fiber, the quality of the signal is reduced over long distances. This application is typically used for short distance, data and audio/video applications in LANs. RF broadband signals, such as what cable companies commonly use, cannot be transmitted over multimode fiber. The multimode fiber has the following for types for different applications. OM3, for a laser-optimized 50um fiber having 2000 MHz*km effective modal bandwidth (EMB, also known as laser bandwidth), designed for 10 Gb/s transmission. OM4, for a laser-optimized 50um fiber having 4700 MHz*km EMB bandwidth designed for 10 Gb/s, 40 Gb/s, and 100 Gb/s transmission. This compact building cable consists of individual 900µm buffered fiber, is smaller in size and costs less than breakout fiber cable.The Connectors may be installed directly on 900µm buffered fiber at breakout box locations. The space saving (OFNR) rated cable may be installed where ever breakout cable is used. Breakout fiber cable consists of several simplex cables bundled together inside a common jacket. Breakout cable enables the quick installation of connectors onto 2+mm robust jacketed fiber, it is a favorite where rugged cables are a desirable or direct termination without junction boxes, patch panels or other hardware is needed. This is a strong, rugged design, but is larger and more expensive than the distribution cables. It is suitable for conduit runs, riser and plenum applications. It’s perfect for industrial applications where ruggedness is needed. Because each fiber is individually reinforced, this design allows for quick termination to connectors and does not require patch panels or boxes. Breakout cable can be more economic where fiber count isn’t too large and distances too long because it requires so much less labor to terminate. Indoor/outdoor fiber cable uses dry-block technology to seal ruptures against moisture seepage and gel-filled buffer tubes to halt moisture migration.It incorporates the characteristics necessary for both applications. 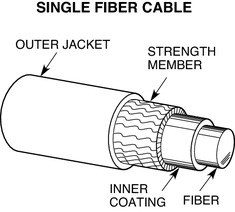 Indoor/outdoor fiber cables are water blocked, sunlight-resistant, and meet one or more of the Code requirements for resistance to flame spread and smoke generation.Comprised of a ripcord, core binder, a flame-retardant layer, overcoat, aramid yarn, and an outer jacket, the indoor/outdoor cable can be run from building to building. Because indoor/outdoor cable is typically plenum-rated, it can be run from equipment room directly to the other equipment room without worrying about fire-safety codes or terminating the cable within 50 feet of the building’s entrance. The cable should be run in a conduit. Below is a summary of selected standards for fiber optics. · ITU-T G.657 – Characteristics of a bending loss insensitive single mode optical fiber and cable for the access network.